In this trail we head to the farthest point in Cambridgeshire, in fact bordering three counties. We stop at three airfields that all have their origins in the First World War. One, a small airfield, played a major part in both the First and Second World Wars. It sat only a short distance from its parent airfield – an airfield that became so big it absorbed it. The other lasted for only a short time at the end of the First World War, but still played an important role in the defence of the eastern counties. Today we visit the airfields at RAF Tydd St. Mary, RAF Collyweston and its parent Station, the much missed, RAF Wittering. Just over the Cambridge border into the area known today as South Holland in Lincolnshire, is a field that was a small airfield during the First World War. Designed for home defence, it was used for attacking marauding Zeppelin airships approaching England across the North Sea. Larger towns and cities such as Norwich and Lincoln were prime targets, although most designated targets were much further north for example Manchester and Liverpool. To protect themselves, the crews of these mighty airships flew at night and at altitude, but navigation skills were poor and crews were generally unaware of their actual location. As a result, they rarely made it beyond the eastern counties or the Fens of Cambridge and Lincolnshire. Because of poor weather and inexperienced pilots flying against these ships, some Zeppelins were able to wander – at the will of the weather – for as much as 10 hours unabated, randomly dropping bombs on what they considered to be ‘prime targets’. A major turning point in this air-war, was the night of January 31st 1916 when nine Zeppelins of the German Navy attacked what they believed to be the industrial north-west. In fact they had barely got beyond the lower regions of Lincolnshire before dropping their ordnance. These attacks resulted in the loss of sixty-one people and whilst no British fighter was known to have engaged the airships, a number of Royal Flying Corps (R.F.C) crews were lost due to bad weather. This disastrous night led to major changes in the Home Defence Squadrons of the R.F.C and R.N.A.S (Royal Naval Air Service), a process that would take a considerable time to complete. As a part of these changes, an airfield was developed just south of the South Holland Drain a mile or so north of the village of Tydd St. Mary. Designed as a class 1 landing ground, Tydd St. Mary covered 125 acres by the time it closed in 1919. Development of the site began in mid 1916 following the re-organisation of the home defence force, but the first units didn’t arrive until the autumn of 1917. Not much more than a field, it did eventually have a small number of Bessonneau*1 hangars and a small selection of crew huts. The main unit to use Tydd St. Mary was 51 Home Defence (HD) Squadron whose main flight was based at Thetford. Formed from the nucleus of 9 Reserve Squadron (RS) on 15th May 1916, they moved to Hingham with flights dispersed at Harling Road, Norwich (‘A’ Flight), Mattishall (‘B’ Flight), ) and Narborough (‘C’ Flight). Initially they were equipped with the BE2c, which were soon replaced by the BE12 and subsequently the FE2b aircraft and then the BE2e in December 1916. For a short while Zeppelin intruder flights were rare and this breather allowed for extensive practice flights by both 51 (HD) Sqn and their partner unit 38 (HD) Sqn who were based a little further to the north. This lull in movements ceased in the autumn of 1916, when a large formation of Zeppelins gathered over the wash and headed for London. Badly hindered by fog and bad weather, they were eventually scattered across the southern and eastern regions of England where they dropped their bombs on remote farmland. This attack caused no damage to property, nor were the Zeppelins challenged in any major way – the marauders had little to worry about other than poor weather. Patrols by 51 and 38 (HD) Sqn’s were in vain, a pattern that was to continue for the large part, for the duration of the war. At the end of 1916, Tydd St. Mary was re-designated a Night Landing Ground (NLG) following the renaming of R.F.C Home Defence Stations. 51 (HD) Squadron would soon fly from here in the defence of the eastern counties. The Zeppelins main advantage over the British was the poor performance of the aircraft types the R.F.C used. Whilst capable of operating at the 8,000 – 10,000 ft altitude used by the Zeppelins, many aircraft simply took too long to get there and thus could not reach the airship in time to attack it. As performance improved along with the development of the explosive ammunition that would ignite the airship’s gases, the odds were a little more balanced and larger numbers of airships were being brought down over the eastern region. The tide was turning and pilots of 51 (HD) Sqn were playing a large part in this. In the early part of 1917 cuts to the Home Defence units were announced based on the increasing gains made by units of the Norfolk / Cambridge / Lincoln squadrons. But the Germans had not given up yet. Reductions in weight enabled new Zeppelins to reach greater altitudes. Now capable of 16,000 – 20,000 feet, few British defences could reach them. As the tide was turning in France, attacks became fewer and fewer. These high altitude flyers were more at the mercy of the bitter cold and poor weather than defending aircraft. In August 1917 51 (HD) Sqn moved their headquarters to Marham, and ‘A’ Flight arrived at Tydd St. Mary and 51 (HD) Sqn began replacing their BE2e aircraft with the Martinsyde G.100 ‘Elephants’ – so-called because of its size and poor manoeuvrability. A large contingent of Airships gathered once more on the night of October 19th 1917, requiring extensive sorties by 51 (HD) Sqn at Tydd St. Mary and her counterparts. Whilst a determined effort was made by the R.F.C crews, they had little or no impact, and the gathered airships made off only to be badly beaten by bad weather and anti-aircraft. fire over France. Further changes to R.F.C Squadron designations in the latter parts of 1917/18, dropped the title ‘Home Defence’ and Tydd St. Mary became the base for 51 Sqn ‘A’ Flight in Eastern Command. Aircraft by now were primarily Royal Aircraft Factory FE2bs, although 51 Sqn were now replacing some of their ‘Elephants’ with BE12b variants which they kept until the autumn of that year. Further changes in February 1918 meant that ‘A’ Flight moved to Mattishall, whilst ‘B’ Flight took their place at Tydd St. Mary. As the R.F.C turned into the R.A.F on April 1st 1918, Tydd St. Mary would once again become significant. On the night of April 12th 1918, Zeppelin L62 was sighted close by and aircraft took off to intercept. As it was dark at 22:00 the flare path was lit to assist the now R.A.F crews, which openly guided L62 directly onto the airfield. Gliding above the site, L62 dropped a small number of incendiary bombs onto the aerodrome in an attempt to damage or destroy aircraft on the ground. 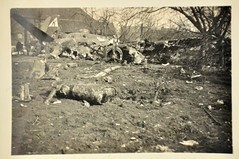 Fortunately the bombs fell well away from parked aircraft and caused no damage to either buildings or aircraft. Pursuit was made by Lt. F. Sergeant in FE2b ‘A5753’, but to no avail and he returned to base empty-handed. Other pilots also tried to catch L62, some crashing due to engine failure, but many simply weren’t able to catch-up with the intruder. Eventually L62 reached the coast and made a break for it across the sea under the protection of yet more bad weather. By November 1918 the final FE2bs had been relinquished and for the remainder of the year and into May 1919, 51 Sqn operated Sopwith Camels. A move by ‘B’ Flight in May to Suttons Farm (RAF Hornchurch) not only signified the end of the Camels (replaced by Sopwith Snipes) but the end of 51 Squadron who were disbanded in June. This departure also meant the end of Tydd St. Mary and in November 1919 notice of closure was given and the site finally closed in January 1920. At its height Tydd St. Mary covered an area of 125 acres, and contained two Home Defence flight sheds as single units (believed to measure 130 x 60 ft). These were utilised by local farmers and business and lasted for many years. Other buildings were also utilised, the last, believed to be the Flight Office, is thought to have been demolished as late as 2009. Not a major player in the war and never to return to aviation, Tydd St. Mary is a notable site and perhaps when passing, a second thought for those who flew from here in defence of the Eastern counties, should be offered. 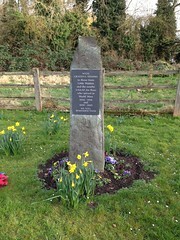 Tydd St. Mary is located just off the A1101 north of Wisbech, and borders Norfolk, Cambridge and Lincolnshire. From here, we head west beyond Peterborough and then cross the great north road the A1. Here were venture in and out of Northamptonshire, but we find two airfields that have become one, and one which is synonymous with vertical take off. We arrive at Wittering and the smaller station Collyweston. Throughout their lives, both these airfields would go through a number of dramatic changes, especially as new ideas, concepts or advancements in technology were made. The biggest initial change may have been as a result of Major Smith-Barry of 60 Sqn (RFC), when he came up with the ‘revolutionary’ idea of teaching people to fly rather than allowing them to prove it! Widely accepted and quickly adopted, it led to the creation of a series of new and unique RFC Training Depot Stations (TDS). The idea behind these TDSs, was to train new pilots from the initial stage right the way through to gaining their ‘wings’ – all in one single unit; a philosophy that would change the way the Air Force would operate for a very long time. Initially the two airfields ran independently from each other, Stamford airfield (later RAF Wittering) opened in 1916 operating as a Royal Flying Corps base for No 38 Home Defence Sqn’s anti-Zeppelin unit. It operated both the BE2C and BE12 fighters. The following year in 1917, it changed to the No 1 Training Depot Station (Stamford), then as a result of the formation of the Royal Air Force on 1st April 1918, it was finally re-named RAF Wittering. RAF Collyweston was located to the western end of Wittering, and opened on 24th September 1917, as No 5 Training Depot Station under the name of Easton-on-the-Hill. It operated a number of training aircraft including: DH6s, Sopwith Camels, RE8s and Avro’s 504. It was also renamed with the formation of the RAF and became known as RAF Collyweston. It continued in the training role until after the war when the squadron was disbanded and the airfield was closed. Photograph of Wittering airfield looking east, taken 9th May 1944. Collyweston can just be seen at the bottom end of the main runway. (USAAF Photography). Two years after the outbreak of World War II, Collyweston was re-opened as a grass airfield, a satellite to its rather larger parent station RAF Wittering. By the end of 1944 it would have a total of 4 blister hangars and would be used by a wide range of aircraft. On May 14th 1940, the first aircraft would arrive, not permanent residents, but a detachment of Spitfire Is of 266 (Rhodesia) Squadron whose main units were based at RAF Wittering. They would stay here only temporarily but return in 1941 for a full month with Spitfire VBs. 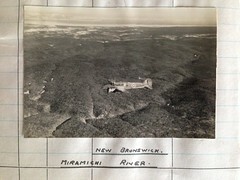 Later that month on the 31st of May 1940, the first permanent residents did arrive, Blenheim IFs of 23 Squadron, who would share the night-fighter role with Beaufighters from RAF Wittering. These Beaufighters were using the new and updated AI MK IV radar, a new model that was so heavy and cumbersome, few aircraft could accommodate it. The new radar was introduced in conjunction with Ground Controlled Interception Techniques (CGI) aimed at locating and ‘eliminating’ enemy aircraft at night. The Blenheims – considered too poor for daylight fighter duties – and Beaufighters would prove their worth operating across the Midland and Eastern regions, eventually flying over to the continent later on in the war. After three months of operations from Collyweston, 23 Squadron would completely move across to Wittering leaving Collyweston empty once more. Then on 28th September 1941 the infamous 133 ‘Eagle‘ Squadron manned by American volunteers arrived with their newly acquired Hurricane IIBs. Armed with four potent 20mm canons, they were a force to be reckoned with. This was however, only a short one week stay at Collyweston, and the ‘Eagles’ moved on to RAF Fowlmere leaving their indomitable mark on this quiet Cambridgeshire airfield. At the end of September 1942, Spitfire VBs of 152 (Hyderabad) Squadron would pass though, staying for three days whilst on their way to Wittering, then North Africa and eventually Malaya. Battle hardened from the Battle of Britain where they had been covering the English Channel and the south coast, they were now non-operational as they began preparing for their move overseas. There then followed a period of change. 288 squadron flying Spitfire VB and IXs would yo-yo around a number of different airfields whilst keeping a detachment at Collyweston. Initially based at Digby, they would be spread over six different airfields (Church Fenton, Duxford, Wittering, Coltishall, Bottisham and Collyweston) creating what must have been a logistical nightmare. The Spitfire would perhaps be their most potent and graceful aircraft which they operated from January to March 1943, before replacing them with Airspeed Oxfords and then Martinets. Moving the main section to Coleby Grange and then Digby, a detachment would remain at Collyweston until the main squadron arrived here in January 1944 – still spread across 6 airfields. In March 1944, 288 Sqn replaced the Martinets with Beaufighter VIs which in turn were replaced with the Vultee Vengence MK IVs in May 1945. After this the squadron moved on and to eventual disbandment in 1946. Throughout their time as an operational unit, they provided anti-aircraft co-operation duties for gunners, flying across the north-eastern regions of England. It was during 1943 that 349 (Belgium) Squadron would reform at Wittering, with Spitfire VAs. They had previously covered ‘defensive duties’ in North Africa using the American built ‘Tomahawk’ , a role that lasted for a short five month period. In June 1943 they reformed, moved from Wittering to Collyweston and then on to nearby RAF Kings Cliffe. After concerns were raised by the then Group Captain Basil Embry DSO, DFC, AFC, about the high number of accidents at Wittering, a proposal was put forward, and agreed, to merge the Collyweston and Wittering grass runways. A remarkable feat that was accomplished not by the Ministry but under the direction of Embry himself. By the time the work was completed, Wittering had a much longer 3 mile, well-lit, runway capable of taking crippled heavy bombers. This move was to really signal the end of Collyweston as an airfield in its own right and apart from a short detachment of Austers belonging to 658 Sqn, all major operational activity ceased. Collyweston would however have one last ‘claim to fame’. The 1426 (Enemy Aircraft) Flight, would operate captured Luftwaffe aircraft in RAF markings. Once new models were found and evaluated, they would be passed on to the flight to be paraded around the country giving ground and flying demonstrations to allied aircrews. 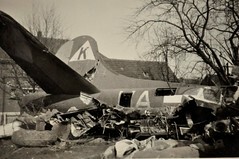 Whilst perhaps considered a ‘glamorous’ role, this was fraught with danger, many aircraft crashing with fatal results. On 10th November 1943, Heinkel He111 H-1 ‘1H+EN’ crashed at the Northampton airfield, RAF Polebrook, killing the pilot and four passengers, and injuring four others. 1426 Flight ceased operations at Collyweston on January 17th 1945, being reformed later that year at Tangmere. Some of these Luftwaffe aircraft were later scrapped whilst some like Ju 88 R1 ‘PJ876’, have thankfully found their way into museums such as the Imperial War Museum at Hendon. With the disbandment of 1426 Flight, Collyweston’s fate had been sealed and it was now officially closed becoming fully absorbed into RAF Wittering. RAF Collyweston as an airfield no longer existed. Remnants of Collyweston have all but disappeared. The original site now forms part of what was Wittering’s huge bomb store. No longer used, it has been the venue for many illegal raves, vandalism is rife and the site has been stripped of cabling and other materials. Whilst there are various ‘urban explorer’ videos on You-Tube, it is completely private land and kept behind locked gates. All other traces are well within the boundary and high fences of Wittering airfield, whilst not openly guarded at this point, it still remains an active military site. Collyweston’s life had been short but notable. A variety of aircraft had graced its runways; it played a major part in the training of crews of the once fledgling Royal Air Force, and had been the new home for numerous captured enemy aircraft. A range of multi-national units passed through its gates, either on their way locally or to foreign lands. It fought bravely, competing against its larger more prominent parent station, it was never really likely to survive, but perhaps, and even though Wittering has ceased operational flying activities, the legacy of Collyweston might fight for a little while yet. You can’t look at the remnants of RAF Collyweston without taking in RAF Wittering. Renowned for its Harrier Squadrons, RAF Wittering was an airfield that fell quiet as a result of the Government cutbacks that affected all the armed forces in December 2010. Sadly it meant the loss of the RAF’s Harrier fleet, an aircraft that had been stunning the crowds at air shows both here and overseas from many years. The Harrier remains one of the few RAF/RN jets to have proven itself in a combat environment, when it took on the Argentinian Air Force in the war over the Falkland Islands in 1982. However, the Harrier squadrons were just one small part of Wittering’s long and established history. RAF Wittering dates back to the First World War, its roots set in 1916 when an airfield was built on the site then known as Wittering Heath. Stamford Airfield, as it was then designated, was to initially operate BE12 aircraft in the anti-Zeppelin role, acting in conjunction with their main force of 38 Squadron at Melton Mowbray. These aircraft would eventually, in turn, be replaced by BE2e, FE2b and FE2d aircraft. During this time a small detachment from 90 Sqn would also be stationed at Wittering, but their stay would be short, between August and September 1918 – they were also flying the FE2b. As the war progressed, Stamford became the training ground for new recruits, forming No1. Training Depot Stamford whilst a short distance to the west a second station was established at Easton on the Hill, operating as No. 5 Training depot. These two sites operated only a stones throw apart but both totally independent of each other. Eventually with the formation of the Royal Air Force on April 1st 1918, Stamford would become RAF Wittering and Easton on the Hill – RAF Collyweston. RAF Wittering had been born. It would go on to be one of the RAF’s most significant airfields operating in excess of 36 active flying squadrons. Some of these would be formed here, some disbanded and many pass through in transit to other sites around the country. 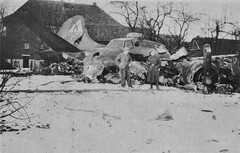 The aircraft here would range from Royal Aircraft Factory Biplanes to Whirlwind HAR 10 Helicopters, Boulton Paul Defiants through Supermarine’s Spitfire to Hawker Hunters; Hawker Siddely Harriers, Vickers mighty Valiant and Handley Page’s ‘V’ bomber the Victor, would all operate from here during its long life. Following cessation of the First World War, Wittering was placed under care and maintenance, looked after and cared for until 1926 when the Central Flying School moved in from their previous base at Upavon. The post war years were turbulent times for the RAF, having not only to fight off Government cutbacks and spending caps, but the Government’s tendency to favour both the Navy and the Army in terms of a national defence force. Since the war’s end, over 23,000 officers, 21,000 cadets and 227,000 other ranks would be lost from the RAF’s service. 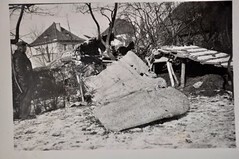 The landing grounds that had been used to fight off Germany’s mighty Zeppelins, along with vast quantities of material and machinery, were disposed of at near give-away prices. The fact that any force had been kept at all was down primarily to the determination and foresight of one Hugh Trenchard who would himself rise to the rank of Marshal of the Royal Air Force in 1927. As global tensions grew in the 1920s and British interests abroad were put at risk, a review was called for of Britain’s defence forces. The review concluded that some 52 squadrons would be needed to provide a sustainable and strong Home Defence Force that would not only be capable of holding back any force that should take desires on Britain, but could also respond adequately by taking the fight to the enemy. So in the mid 1920s the RAF’s expansion began. 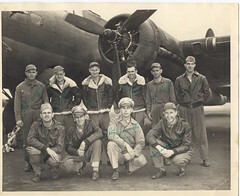 The first four Auxiliary Air Force squadrons were formed along with the first of the University Air Squadrons (UAS). A combined Air Force Cadet College and flying training school was established at Cranwell along with the Air Force Staff College at Andover, – the fledgling Royal Air Force was making its first proper steps in the right direction. Further tensions in the 1930’s brought home the need to develop and increase the Air Force. The not so subtle build up across the channel with increasing tensions in Germany, meant that she was rapidly becoming a major threat. Now woefully under manned, the Government poured money and manpower into improving the stature of the Royal Air Force. With design and engineering pioneering the way in long distance flight, speed and manoeuvrability, new models of aircraft were being designed. Monoplanes were the way forward and with Britain winning the Schneider Trophy for the final time, the way ahead was set for aircraft capable of incredible speeds and performance. With war looming, Wittering was about to come into its own receiving its first operational squadrons both 23 Sqn and 213 Sqn in May 1938. By the end of the following year, Wittering would be designated Sector Station of 12 Group whose responsibilities stretched from the boundaries of London in the south, to the Welsh border in the west, Liverpool and Hull in the north and the entire eastern counties. Wittering units would be responsible for a wedge through the middle of this sector running from the North Sea coast to Wales. In that same year, Spitfire Is of 610 Sqn Auxiliary Air Force joined the recently arrived Blenheim IFs and Hurricane Is before they headed south to Biggin Hill in support the BEF’s evacuation from Dunkirk in May 1940. Wittering was really too far north to be able to effectively participate in the either the Battle of Britain or the defence of London; fuel and journey times would have left her fighters at a disadvantage, so Wittering concentrated on both resting and reforming battle worn units from the south, and defending the industrial Midlands and the north. Her units would become key in the night fighter role, protecting the eastern and North Sea routes from the Luftwaffe – a role in which her squadrons would learn and develop very quickly. 23 Squadron were key in this very role. Dispersing their Blenheims at Collyweston, they shared Wittering with Hurricanes of 32 and 229 sqn, Spitfires of 74 and 266 Sqn and Defiants detached from 264 Sqn. These fighter versions of the Blenheim benefited from the addition of a bolt-on underbelly gun-blister housing four .303 machine guns; but they lacked any technologically advanced radar or Airborne Intercept (AI) mechanisms and so relied heavily on visual identification, referred to in the ranks as ‘Eyeball Mark One’! 23 Squadron would fly a number of patrols from Wittering, intermixed with sections being detached to RAF Digby for night flying co-operation duties on a weekly rotation basis. Few of these night patrols proved to be fruitful however, and many enemy aircraft escaped simply because they could not be found in the dark skies. To improve kill rates, carefully drawn up patrol lines were set up fanning outward from Wittering. Often, pilots would use distant searchlights as a guide to locating the enemy intruders, however, this had its dangers and some RAF crews were lost because they too found themselves illuminated in the dark night sky, only to become victim to the enemy or the over eager A-A crews below. 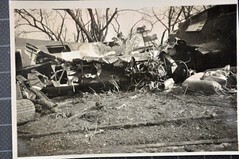 One such incident occurred on the night of 18th June 1940 when Blenheim L1458 ‘YP-S’ crashed near RAF Sutton Bridge as a result of being shot down by a He111 from KG4 that it was attacking. In getting close to the Heinkel, the Blenheim was itself caught in the local searchlight and the Heinkel returned fire. The pilot Sergeant A.C. Close, died as a result of the crash whilst the air gunner, LAC L. R. Karasek bailed out at low-level and was taken to Sutton Bridge and treated for his injuries*1. The autumn of 1940 saw further changes at Wittering. In August, 266 Squadron arrived using various models of Spitfire, whilst in September, 23 Squadron departed moving to RAF Ford. Then in came No. 1 Sqn, the oldest RAF squadron, with Hurricane MKIs. Battle hardened from the fall of France and a summer of fighting in the skies over Kent, they remained here until the end of the year before returning south in the defence of London once more. It was around this time too that a detachment of Hurricanes from 151 Sqn would arrive from RAF Digby, a station Wittering worked very closely with. After a short period these were replaced by Defiant Is also participating in the night fighter role. One determined and perhaps aggressive pilot, Flt Lt Richard Payne Stevens DSO, DFC would bring an element of mythical mystery to the flight as the squadron moved through Hurricane IICs, Defiants IIs and onto Mosquito IIs before the now permanent squadron left for Colerne in April 1943. Using nothing more than his remarkable night vision, he would become the greatest scoring night fight pilot during the Blitz, downing a total of 12 Luftwaffe bombers in his black Hurricane. In November / December 1940, 25 squadron came in bringing with them the much improved, faster and better AI equipped Beaufighter IF. 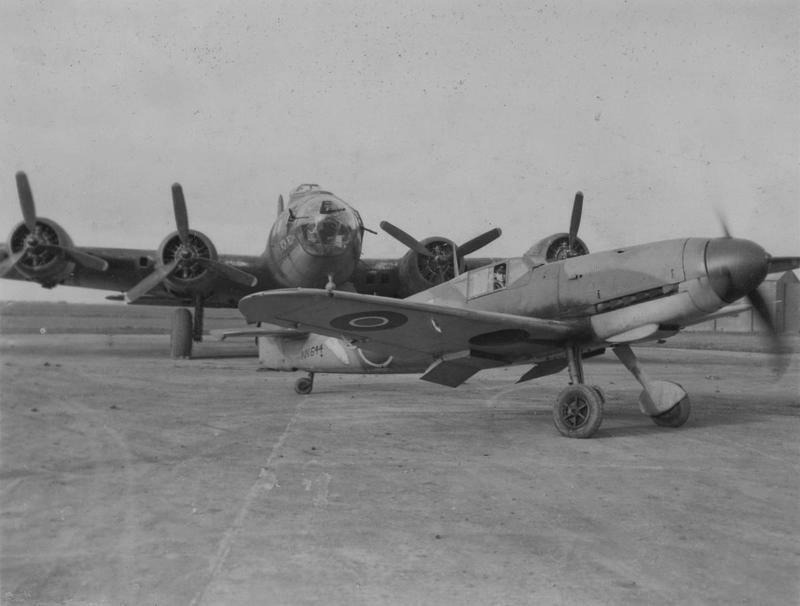 In addition, a single Beaufighter MKII was also deployed here purely for evaluation purposes. A rarer Merlin engined model, R2277, it was credited with the shooting down of a Ju88 on the night of June 22nd 1941 when piloted by F.O. Michael Herrick and his radar operator F.O. Yeoman. It was later stuck off in June and remains the only Merlin powered model to enter the books of 25 Sqn*2. At the end of 1940 a new commander arrived, Group Captain Basil Embry, who disliked the Defiant as a night fighter and considered Wittering too poorly designed for a night fighter station. He set about devising a plan to join adjacent Collyweston and Wittering together to develop and create a single airfield with a new much longer hard runway to replace the grass ones used until now. The expansion was completed in record time, Embry by-passing the more conventional channels of procedure. In July 1941, the Beaufighters of 25 Sqn were replaced by the Douglas (Boston) Havoc Mk Is, an aircraft they took to Ballyhalbert (Ireland) in the following January. The summer of 1941 would also see another new experimental model arrive. In conjunction with operations at RAF Hunsdon, the rather ill-fated Turbinlite project was put into operation here. Elements of the 1451 Flight were formed into a new squadron designated 1453 Air Target Illumination Flight, a concept that involved bolting an enormous 800,000 watt lamp to the front of the aircraft. As these modified Havocs were now much heavier, they could not carry any weapons and so relied upon an escorting Hurricane, Defiant or Spitfire to shoot down the enemy once located by the massive 950 ft wide beam of light. On October 22nd 1941, 151 squadron carried out its first official Turbinlite operation. Fighter command decided to establish 10 dedicated Turbinlite squadrons in total, numbered 530 sqn- 539 sqn, they all became operational on either the 2nd or 8th of September 1942. On the 2nd, 532 was formed at Wittering using a combination of 1453 Flight and Hurricanes from both 486 Squadron and various Operational Training Units (OTU). The rather poor performance and low success rate however, meant that all these units were disbanded in one fell swoop on January 25th 1943*3. It was part way though these operations (April 1942) that 151, released from their restrictive Turbinlite operations, replaced their Defiant IIs with the new ‘Wooden Wonder’ the Mosquito NFII. Only the second squadron to use them, they were to prove a formidable weapons platform and a deadly night fighter. The night skies were now a prime hunting ground and partly as a result of the Mosquito successes, the number of Luftwaffe intrusions began to reduce. The turn of 1942/3 wold see further changes at Wittering with many short stays by 118, 288 (on Detachment), 349, 141, 91 and 438 Sqn taking Wittering through the new year. 151 remained until April moving off to Colerne and new model Mosquitoes, 141 who replaced them brought more Beaufighters in the form of VIFs. With increased engine power, more fuel and a capacity for increased bomb loads, the VIFs had modified noses to accommodate the new AI radar. Now the hunters were taking the war to Germany and intruder missions began to take place. During this time Wittering was also home to No 1426 (Enemy Aircraft) Flight, utilising the former RAF Collyweston site which evaluated captured enemy aircraft. A remarkable unit they flew captured aircraft around the many bases of the RAF and USAAF for crews to examine. As the war drew to a close, sorties began to get fewer and fewer, and operational flying at Wittering would all but stop. Other than the P-38s and latterly P-51s of the USAAF 55th Fighter squadron – who had been sharing Wittering with their RAF counterparts – Wittering became operationally quiet. Eventually the war ended and various units used Wittering for training and experimental work. Post war 1946, 23 Squadron was reformed here from the ashes of 219 Sqn, taking their Mosquito NF30 to Lubeck almost immediately. A range of squadrons using various piston-engined aircraft passed through Wittering and two reception centres were set up to receive incoming POWs from the continent. By the end of 1948 all aircraft had left , and it returned to its roots once more becoming the home of No. 1 Initial Training School, Flying Training Command. In the early 1950s, Wittering was placed under care and maintenance whilst upgrading work was carried out to its runways. During August 1953 both Lincoln bombers and Canberras (B.2, B.6, PR7) would operate overseas from here – these included detachments at the infamous Christmas Island. Further Canberras of both 76 and 40 Squadron would fly from Wittering and in 1955 Wittering entered the atomic age with the arrival of the Vickers Valiant. Operations using conventional bombs were seen during the Suez crisis in 1956, when Valiants from No 138 Sqn flew 24 missions against targets in Egypt. Two other squadrons would fly the enormous but less favoured ‘V’ bomber: 49 and 7 squadrons, and it would be 49 Squadron who would take Britain forward as a nuclear nation when in 1956 a Valiant B.1 dropped Atomic bombs on both the Maralinga Range (Central Australia) and in 1957 a total of 6 Hydrogen bombs over Malden Island. During this time the aircraft were operating as detachments from Wittering, again on Christmas Island in the Pacific. With no decrease in the perceived threat from the Warsaw Pact, the ‘V’ bomber force would continue from Wittering for a few more years . The Valiant being replaced by the Victor B.2 and later B.2Rs of 139 and 100 Squadron, who had themselves been disbanded in September 1959 to reform at Wittering in May 1962. In December and September 1968 respectively both these squadrons were disbanded and Wittering would then enter the dawn of vertical take off and landing. A short stay by Westland Whirlwinds HAR.10s of 230 Squadron led to the arrival of probably one of the most famous aircraft in aviation – the Harrier. In August / July 1969 No. 1 Squadron returned to Wittering, its first time since the 1940s. Wittering became famous as ‘The Home of the Harrier’ and its fame would spread far and wide. With combat success most famously in the Falklands campaign and later the Balkans, Serbia and Kosovo, it would go on to serve Wittering well flying the GR.1, GR.3, GR.5 and GR.7 before moving away to Cottesmore and disbandment in December 2010. The only other units to fly from here (less any training squadrons) were 4 Squadron flying both the Hunter FGA.9 and Harrier GR.1, 45 Squadron and 58 Squadron both flying the Hunter FGA.9 until they were disbanded on the same day 26th July 1976. With that flying ceased at Wittering, but it remained an active military base operating a number of logistics units including a wide range of logistical support organisations. It is also home to the RAF’s bomb disposal squadron 5131 (BD) Sqn. Further reorganisation of flying training units has been Wittering’s saviour. Today 100 years after its inception, and after a 6 year gap, flying has finally returned to Wittering, with the re-introduction of flying training units from No.3 and 6 Flying Training Schools, relocating here from both RAF Wyton and RAF Cranwell. It would seem that Wittering has gone full circle again, not once, but twice, with its history rooted deep in the First World War, it has always been one of the RAF’s most important airfields. It has trained aircrews, defending these shores against the night terrors of two World Wars, and its crews have defended us against invading forces both here and in British Territories far off. Wittering forces have provided a strong and powerful peace-keeping force across the globe and even today it plays a major part in support, training and defence against those who wish to cause harm to both British sovereignty and democracy. Note: As a fully active military site, much of Wittering is understandably hidden behind high fences and trees. When passing along the main A1, the main gate, and some buildings are visible, but stopping is not permitted. There are other places to the rear of the airfield but views are limited and little can be gained from using them. Permission should be sought before approaching the site. Sources and Further Reading (Tydd St. Mary). 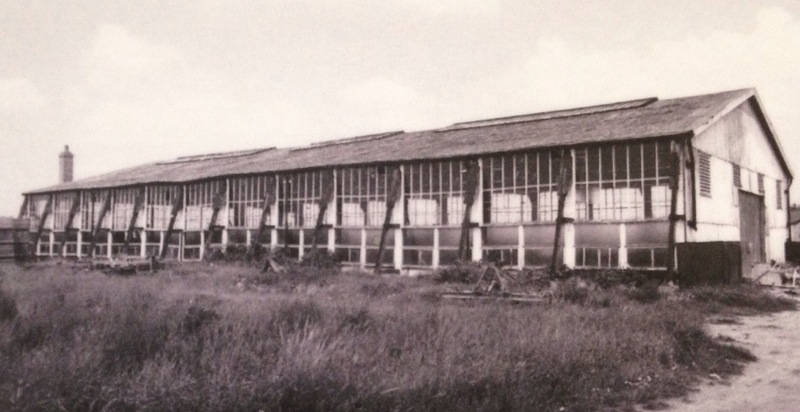 *1 Early Bessonneau hangars were constructed of wood covered in canvas. Various types were made and were designed to be erected by small trained groups of men. Later models replaced wood with metal and were more permanent. *2 Photo on display at Thorpe camp, Woodhall Spa. Sources and further reading – (RAF Wittering).